Part of living with disabilities is learning the best way to adapt to the rest of society. In an ideal world, there would be an option for special needs everywhere we go and for everything we need to use, but it’s simply not the case as of yet. However, there are great strides being taken in technology focusing on the inclusion of people struggling with motor skills and limited mobility, and we’d like to highlight just a few innovations and accommodations we’re particularly impressed with! If you can’t operate your own vehicle, public transportation is the best alternative for independent transit. The MetrO mobile and tablet app allows you to download maps of over 400 cities all over the world and search by bus, tram, subway and railway routes. Once a city is downloaded, you can even access the map without an Internet connection. And if you happen to be a New York City resident, the Wheely NYC disability app can provide an in-depth wheelchair-accessible subway map of the city. So, it looks like the “how” is covered, but “where” exactly can you go? Wheelmap is an online map that you can use to find wheelchair-accessible locations, and users even contribute their personal experiences through photos and comments. In the case that you arrive at a certain location and a handicap parking spot is occupied illegally, the Parking Mobility accessibility app helps you report the violation to the city. You can also search for and add accessible parking spots through this application as well. Let’s face it. If we’re leaving the house, at least half the time it’s probably for food. Download the LocalEats app and easily filter your local restaurant searches for handicap access. Or take it easy and filter for locations that deliver! When it comes to physical activity, people with disabilities must confront the challenge of customizing exercises to fit their needs. Physiotherapy Exercises is a library of over 600 types of exercises, and you can search by conditions such as old age, motor delay, hand injury, spinal cord injuries and more. While the app is geared towards physiotherapists and medical professionals, as it heavily uses medical terminology, it can still give you an idea of what key areas to focus on. Most importantly, put the state of your health in your own hands instead of the exam room. Track your daily activity with the help of Azumio’s health and fitness applications. Monitor everything from your sleep and heart rate to fitness routines and even glucose levels. With vast changes being made to mobile and tablet devices at an alarming rate, these devices are not always user-friendly for people with disease or disability. Tecla Access makes it possible for an adapted external switch or wheelchair control to translate actions on an interface users are comfortable with to their tablet or smartphone. 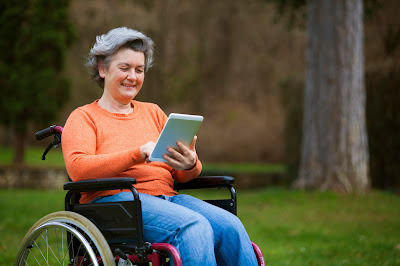 Apps aside, tools such as the Limitless Stylus, a comfortable stylus attached at the wrist, and the MagConnect, a magnetic wheelchair tablet mount, are wonderful starting points in terms of adaptive technology solutions. Have some favorite tools or apps of your own? Feel free to share the knowledge and give us a rundown in the comments below! Note: Android app versions also available.